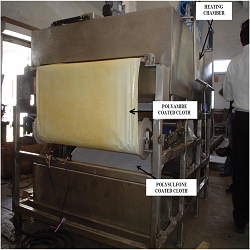 Subsequent to polysulfone coating, thin film of polyamide coating is carried out on polyamide coating machine to get Thin Film Composite (TFC) Reverse Osmosis (RO) polyamide membrane. This coating is carried out on a polysulfone support membrane. Integrated Group is a technology oriented company with core expertise in motion control, automation and Mechatronics having done various prestigious projects and built systems for research Institutes and major Industries. We are in this field for more than 20 years. We have an experience in working with various industries including Atomic & Nuclear, Pharma, Chemical, Food, Hotel, Material Handling, Machine Tools, Plastics, Wire industries, Elevators, Textile for applications like NDT scanners, painting and powder coating, Cut to Length, Packaging, Labeling, Capping, Dosing and Weighing, Printing, CNC / RP, Handling & Robots, Paper Converting, Bending machines, Sewing / Embroidery fitness equipments and many more.